First one I need to find long sides which name in English I don't know. For second one I need to find how far k is from a,b,c and how long are edges. the longest side of a right triangle is called a hypotenuse. is the second diagram a tetrahedron ... something like this? As for second it's something like that and I need to know AB and BD while I know that AH is 8 and AE is 10. I need to know AB and BD while I know that AH is 8 and AE is 10. 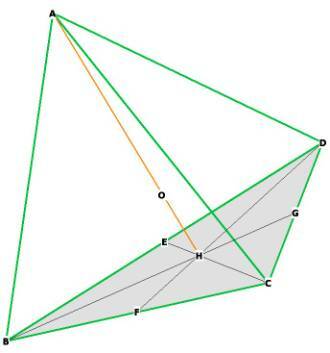 EC, FD, and GB are medians which intersect at the centroid of the base equilateral triangle ... the intersection point divides each median into a 1:2 ratio, so if EH = 6, then HC = 12 and EC = 18. Do you maybe have some site with formulas for what I need, since when I try to do it with little I know about geometry and some formulas I found on internet I get different results, and I can get 45 45 90 triangle to be right if I put x in like this √2*36 but it doesn't work for other one and if I try to get 6 from √3x other numbers are wrong and huge, and as for second just to make sure AD=AC=AB and how would you prove that EH is one third of EC? Sorry if these are dumb questions, it's just that there is allot of simple things that I haven't learned for one reason or other. Yes, your background in geometry is limited ... which makes me wonder why you are attempting these problems at all. Remediation is available. Two you-tube videos to start. 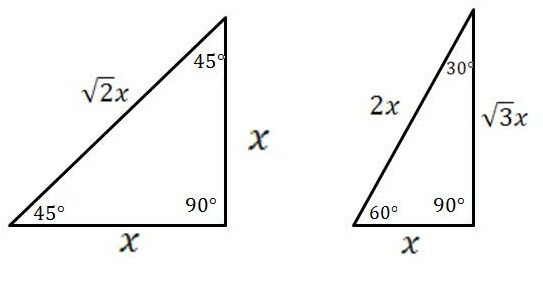 First one is about special right triangles; second is about medians of a triangle. So how did you get x to be 2√3? And as for stupid reason, I'm lazy and could get by without studying, I'm trying to catch up, unfortunately haven't got this far.